German cinema and television have in recent years begun to address the suffering of the ordinary German during the Second World War, and during the reign of terror perpetrated by the Nazi regime. When I say ordinary German, I refer to those not otherwise specifically singled out by the Nazis for brutality and dehumanization: Jews, communists, socialists, homosexuals, Gypsies, artists, intellectuals and others the Nazis considered deviant or impure. It’s a delicate subject still, and likely will be for as long as the war is examined, written about or addressed in film, the tribulations of those who can be viewed simultaneously or separately as the inflictors and the inflicted upon. Dwight MacDonald, in his acclaimed essay, The Responsibility of Peoples cast doubt on the holding to account of entire populations for crimes perpetrated by their government, or a ruling regime, arguing that ordinary citizens should not be held to the standard of heroism, expected to have behaved heroically, or with risk to their existence, which resistance to, or non-cooperation with the Nazi regime required. Yet, given the unimaginable scope of misery and death and depravity unleashed on the world by the German nation, any sympathy whatsoever for ordinary Germans, even those not directly culpable for Nazi brutality and criminality is problematical. But Germans suffered. At least eventually. In Lore, an Australian-German film, the victims are in fact entirely innocent: children, in this case the children of Germans who were fully complicit in the Nazi grotesquerie. The title character Lore, whose high-ranking Nazi parents have fled in advance of the invading allies, is left to manage not only her own fate, but that of her four siblings, though still only an adolescent girl herself. The bulk of the film then is the journey on which Lore shepherds her charges across a ravaged, and predatory post-war landscape to the home of their grandmother and to relative safety. This landscape fully reveals to her, and to us, what was, for so many Germans, the unseen reality and eventual cost of so many years of war, of internal terror, and at last, defeat. One might say that Lore’s coming of age, sexually and politically, reflects the coming of age more broadly of the German people, many of whom remained, or claimed later to have remained in something like a state of innocence, as the world around them was brutalized and viciously corrupted. As Lore confronts what has really been happening beyond her somewhat idyllic home life, which in fact masked her parents’ complicity in a concentration camp, the larger question of many Germans’ convenient incuriosity is inescapable. Director Cate Shortland has skillfully made her combined tale of survival, and a unique coming-of-age under frightening duress, spellbinding, moving and certainly harrowing. Saskia Rosendahl as Lore, is brilliant. It is a story undeniably painful, but in its way, stirring. Lore’s journey through hell is reminiscent in some respects of the journey made by French writer Louis-Ferdinand Celine through a devastated Germany in the immediate aftermath of its defeat on his way to Denmark, passing by train and on foot through the ashes of the Third Reich, a journey portrayed in a series of novels: North, Rigadoon, and Castle to Castle. But more commensurate with the surreal horror and level of physical devastation Celine saw, is what is witnessed in the extremely powerful film, A Woman In Berlin. While not a journey, but a story set in a single city, occupied Berlin, it conveys what Germany and its people had been reduced to in defeat, in the most compelling and visceral way imaginable. 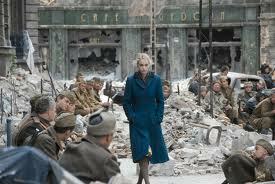 Directed by Max Farberbock, and starring Germany’s outstanding, and prolific actress, Nina Hoss, the film is based upon the book of the same name, an autobiographical account of the period April 20 to June 22, 1945, an account published anonymously for the protection of its author. The woman of the title was revealed, several years after her death by a literary editor as Marta Hillers, a newspaper and magazine journalist who occasionally served as a Nazi propagandist, though was not believed herself to be a Nazi. As children and old men defended Berlin in the streets until the bitter end, Berliners, already desperate, girded for the coming quest to survive, which would only become more desperate. Seen largely through the eyes of the woman, but depicting the fraught plight of others attempting to survive similarly, some in her company and others not, the privation, demoralization, humiliation, remorse, guilt, regret and physical peril ordinary Germans confronted were overwhelming. Showing in such detail, with such excruciating starkness what survival required for these inhabitants of the defeated capital, and the defeated nation under the ruthless occupation of the Soviet army, some scenes literally are a challenge to witness. The perilousness is no less psychological than it is corporeal. To describe what some, and the woman of the title in particular were forced to resort to in order to survive using the word compromise, would be to describe it so inadequately as to do so to the point of ludicrousness perhaps. And of course, many in fact did not survive. In the end, the slice of history here so magnificently portrayed cinematically is as unforgettable, or should be as unforgettable as much else about that benighted period of the 20 Century. The film is a harsh, though rich experience of it, and I believe, a great cinematic achievement. The three-part movie for German television, Generation War directed by Philipp Kadelbach, also presents a view of life during the war for ordinary Germans, on the home front as well as actually fighting the war itself. More of an everyman tale, or interwoven group of tales, the perspectives of the five young friends reflect the variety of ways ordinary Germans might have experienced the war. The five, two brothers, both of whom fight, a female singer, the fiancé of one of the brothers, who eventually serves as a nurse near the Russian front, and a Jew, his fate not unlike the fate of other Jews in some respects, but not in others, are followed from their giddy days as young, quasi-bohemian Berliners simply relishing the headiness of their youth, through to the grim, dejected aftermath of war. As one would expect, this is a broader view of the German experience, though the film succeeds quite well as a convincing drama about five individuals in their own right, each interconnected story compelling in and of itself. The photography is especially exquisite, and the vividness of Berlin in the early days of the war, of the battles on the Russian front and of the Polish countryside stand out in particular. If the film has a flaw, it is that, while it is clear none of the friends are members of the Nazi Party, or as far as we can tell, endorse the Nazis’ views or their regime (we don’t know this to be the case, but we infer it) the film eludes any discussion of politics among the five friends, any opinions, even the most rudimentary, of who the Nazis are, what they are doing, and more broadly, what the ordinary German public is thinking. To some extent, this remains the Sixty-Four Thousand Dollar Question: how or why the German people, the ordinary Germans allowed all of this to happen. How complicitous were they, or perhaps more accurately, to what degrees were they complicitous? Were most swept up in the prevailing nationalism, or simply going along? How prevalent was doubt? How did most Germans feel about the German racial policies? About German military aggression? To what degree were the Germans caught unawares by the ultimate infamy and derangement of Hitler, and of his henchmen? How much of the German complicity, or failure to resist, was simply fear? None of these three films provides an answer to any of those questions, nor any sense really of what those answers might be. For that, we must await another more scrupulous German take on that central issue of the ordinary German experience of the Nazi era.